Nativity exhibitMaria Stein Shrine of the Holy Relics, 2291 St. John’s Road, Maria Stein. “Modern Takes on a Timeless Theme.” Donation. mariasteinshrine.org or 419-925-4532. MARIA STEIN — A nativity exhibit will be on display from Dec. 1 to Jan. 7 at the Maria Stein Shrine of the Holy Relics, 2291 St. John’s Road. The sets are from the collection of Tim and Katheleen Nealeigh. The exhibit is called “Modern Takes on a Timeless Theme” and includes those made out of kitchen utensils complete with corkscrew angel, to a set that was glazed with horse hair, which burned artfully when the figures were fired. Donations will be accepted. For details, visit www.mariasteinshrine.org or call 419-925-4532. MARIA STEIN, Ohio (November 19, 2018) – From Dec. 1 though Jan. 7, The Maria Stein Shrine of the Holy Relics is hosting a Nativity Exhibit from the collection of Tim & Katheleen Nealeigh entitled “Modern Takes on a Timeless Theme”. “I purchased my first nativity in 1965 when I was teaching in Northern Illinois. On my way to the train station, I passed a religious store and paid the equivalent of a month’s salary. I still have that set on display,” says Nealeigh. His second set was purchased shortly after in France, but it wasn’t until the boom of the internet and e-Bay in the 90s that Tim and Katheleen’s collection really started to grow. The Nativities this year range from those made out of kitchen utensils complete with corkscrew angel, to a set that was glazed with horse hair, which burned artfully when the figures were fired. 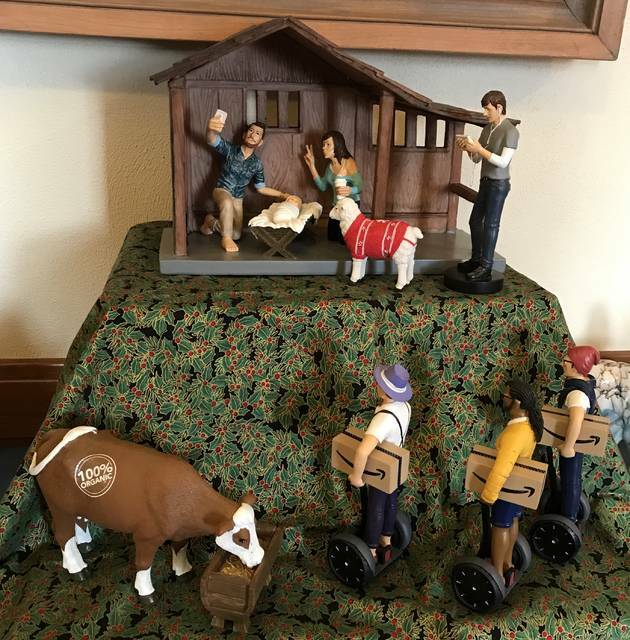 Since the first nativity scene was developed by Saint Francis of Assisi, different people have been putting their own spin on the birth of Christ. This display of nativities showcases the various ways the Jesus’ birth has been interpreted. This year’s collection especially takes us out of the Bethlehem stable and into the ordinary circumstances of our contemporary lives and tastes. Enjoy this intriguing and beautiful display during normal Shrine Hours now through January 7th, but it will be closed on Christmas Eve, Christmas Day and New Year’s Day. There is no charge to experience the nativities display; however, a free will offering will be graciously accepted. The Maria Stein Shrine of the Holy Relics provides faith nourishment and spiritual renewal through opportunities for prayer and pilgrimage and inspiration from the lives of the saints. People from around the world visit the shrine to explore and enjoy this environment rich in holiness and history. The Relic Chapel is home to the second largest collection of relics of the saints in the United States. The Shrine is located at 2291 St. John’s Road in Maria Stein. To learn more about the Maria Stein Shrine of the Holy Relics, visit www.mariasteinshrine.org or call 419-925-4532. This entry was tagged 010119, 010219, 010319, 010419, 010519, 010619, 010719, 120118, 120218, 120318, 120418, 120518, 120618, 120718, 120818, 120918, 121018, 121118, 121218, 121318, 121418, 121518, 121618, 121718, 121818, 121918, 122018, 122118, 122218, 122318, 122418, 122518, 122618, 122718, 122818, 122918, 123018, 123118. Bookmark the permalink.